Traditionally, the retail sales of alcoholic beverages (wine is still categorised as one) in India have been largely confined to behind-the-counter prison cell resembling iron grilled shops that require you to crane your neck for a view of the dusty (and stressed) labels standing on the shelves inside. In the last 10 odd years, a shift was discernible with private licenses coming into play and even the state-owned liquor vends getting into the act of improving the conditions of wine retail. 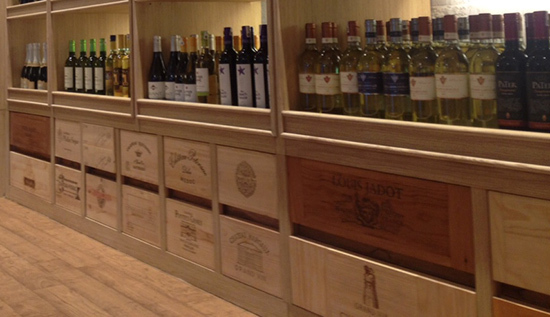 Wine retail in New Delhi just got a generous dose of luxury. La Cave (French for "The Cellar") in Select CityWalk in Saket, New Delhi offers to take wine lovers on a journey of delight and redefines the approach. WINE is in the spotlight in this mint fresh liquor vend. 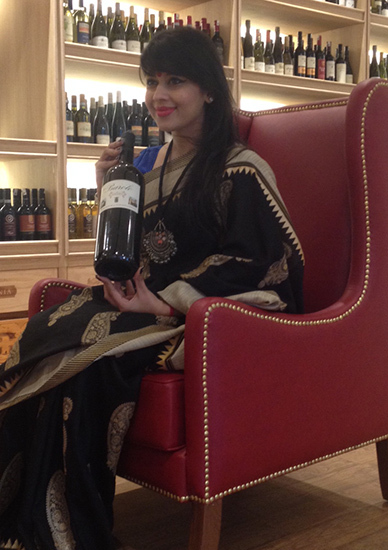 Passionate owner, Madhulika Bhattacharya Dhall – fitness freak, radio jockey, communications guru – earned her spurs in wine much before she was recognised as the better half of Aman Dhall – India’s top wine importer. She has put in late hours (in compliance with strict mall regulations) to transform at Cinderella hour and beyond, what she inherited from the erstwhile House of Spirits into what she envisions to be world class wine (and spirits) retail. Yes, the market dynamics expect her to offer spirits, and she is determined to make La Cave a commercial success even if it is in Delhi's highest rent seeking mall. Madhulika's personal touch is obvious in the clean, airy and inviting walk-around space that oozes oomph with a classy décor and well thought-out props – a centerpiece wine barrel display and the lounge setting in the façade that re-creates a wine experience complete with a book and reading glasses. The trophy wine section occupies the largest space in the store. Branding from original wooden wine boxes have been aesthetically fabricated into the counters and drawers. Why the fuss around La Cave? There have been nice ambience walk-around wine cellars within liquor vends around the city before. "Unmatched service levels and a solid supply chain" is Madhulika's answer. 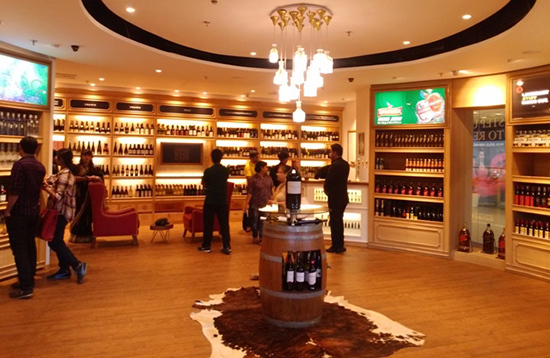 This expansion is a forward integration for Brindco Limited, and the country's top wine importer knows the wine world and its customer best. Complete control over the wines – direct from the winery to the time they land on Indian soil – the wines storage and travel at every step is in optimum conditions. For any wine lover in India (often stung by "off" bottles), this assurance is worth its weight in gold. Enviable standards are being put into place to take the customer experience to a new level – an in-house sommelier is on hand for expert advice and a wine concierge visit homes to help with food pairings for the wine(s) purchased. Forget carrying nondescript black polythene carry bags, as specially designed stylish wine carry (gift) bags are the check-out norm. The staff is not surprisingly clued-in and attentive – they are driven by Madhulika personally. A selection from the widest range in wines that has so many customer favourites that is available to the customer in India allows Madhulika to be upbeat. Currently, La Cave offers 250 wine labels – this is still work in progress. Brindco has offered some labels exclusively to La Cave and allows them to offer the most competitive prices in the duty paid segment. The "Prestige" collection is distinctly defined to showcase the best that is on offer – icons like the Bordeaux Château Palmer of the vintage 1996. Not all customers stay here very long, and the extensive offer allows for all budgets, all occasions and all tastes to be accounted for. Are we implying that La Cave is the ultimate in wine retail? We dare not, as the term "perfection" would imply halting of progressive growth. Madhulika insisted that we share some areas of improvement – so we did share some concerns. The visibility of some labels was poor because of the wooden stays on the shelves to protect them from falling over. She pencilled in action. The bottles on display were upright. She told us that number of display bottles was limited and the turnover was so high that applying the first-in-first-out principle allowed them to sell stocks before the problems of dry cork set in, and it offered the customer a better browsing experience and a better visual display. She agreed that as the store evolves and the inventory grows, this would have to be closely monitored. Will she offer more information to the wine buyers? She was working on that but Aman Dhall chipped in to share the restrictions that the regulators had on information being handed out and the sale of wine accessories. The party pooper as always! Cynics might argue that La Cave's extensive offer that leaves customers "spoilt for choice" is monopolistic. Rightfully so, but Madhulika defends her decision as she believes that no compromise is possible on the service commitments and guarantees that she has outlined – and external suppliers would create just that doubt! La Cave is an initiative that offers vinos a congenial and rewarding wine buying experience. vino india hopes that it will set the trend.